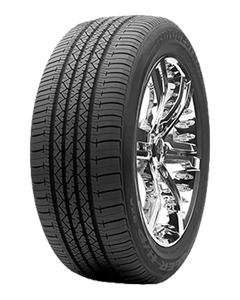 The Dueler H-P 92A is an all-season, high performance tire designed to complement modern Cross Utility Vehicles. It is an Original Equipment (OE) choice used by manufacturers such as Infiniti. OE Highway All-Season light truck tyres are typically purchased as direct replacements for worn-out pairs/sets of the vehicle´s original tyres. They can also be used for other vehicle applications in complete sets of four or axle pairs if available in an appropriate size, load range and speed rating to match the existing OE tires´ performance category and specifications.